The Old town of Regensburg with Stadtamhof has an almost intact medieval city center with many romanesque and gothic buildings. Regensburg was an important trading centre along the Danube. It was also home of the assemblies of the Holy Roman Empire in the High Middle Ages. Its roots lie in the Roman town of Castra Regina. Regensburg's nomination dossier seems to document every single structure in town. This will make great historical material in a few hundred years! ICOMOS however was not amused, and complained that it's not about the number of sites but about themes they represent. I made good use of the lists of structures from all ages and plotted the most interesting sounding ones on a map of Regensburg. I visited the town on a day trip from Bamberg. A good place to start is the historical museum, which holds a large exhibition on the local Roman history. It shows how the Roman militairy camp developed into a town. All very well displayed, although signs are in German only. Entrance fee is 2,20 EUR. I then checked out two of the most prominent tower-houses, something that I never expected to see here. Most of the buildings here look very new, they have been restored extensively in the 1990s. They all have signs telling their historical value. Some sites I couldn't link to the description in the nomination file however, for example I noticed no wood at all at "the oldest completely preserved wooden building in Germany" (Keplerstrasse 12). Back on my way to the train station I had a quick look at the Monastery of St. Emmeram. It still has very old frescoes at its facade. In all I spent about 3.5 hours in town and I had to rush at the end to catch my train. To get the most out of a visit to Regensburg, the best thing to do is just walk through its streets. Even the buildings of no particular note that line the alleyways all come together to create the sense of medieval city. The particular highlights of the city are all within a very easy walking distance of each other. From the Roman Bridge, walk up into the centre of town to see the cathedral, cut across to the old town hall, through the Haidplatz square and over to St James’s Scottish Church. The various public squares are nice places to stop for a rest. The fountains or statues in the centre of many of them are little homages to the city’s past and the buildings surrounding them have authentic and artistic facades. Regensburg is popular with tour groups that move in large mobs but they tend to stick to the main streets. Getting away from the obvious paths and exploring the alleyways will not just give you a bit more peace, it will also show you how small businesses and residences of today have been incorporated into the original buildings. Ah, such a familiar feeling: 2 hours of strolling in the drizzle feeling slightly underwhelmed by another variation of a European Town, a few hours later I'm rushing for the train feeling like I want to relocate to the city after something intangible suddenly wins me over. Yep, I ended up smitten with yet another small/medium sized European city. Initially I wasn't really swept away by the main sights. The cathedral was large and grand, but nothing really exceptional for me (though maybe I am just getting a little too blasé about these as I have visited so many). The remains of the roman walls were rather underwhelming and then I was shooed away from sheltering under an awning whilst trying to eat some sausages and order a beer at the famous Wurstkuschl, I was feeling damp and discouraged. Things picked up in the excellent world heritage museum next to the bridge, which like many other such museums did a great job of explaining the Outstanding Universal Value of the site as well as the history and personalities associated with it. As the rain abated I went for a stroll to Stadtamhof on the other side of the river the crossing was very reminiscent of the Charles Bridge in Prague, just missing the statues and the looming castle. Stadtamhof was pleasant with a few nice cafes and a different feel to the rest of the city. Things really improved for me as I called into one of the city's 3 breweries Spital, the large garden was closed but the charming old school ambiance and service inside helped elevate my spirits for the return to the city centre. Highlight after highlight surprised me on my return to Regensburg proper. I wasn't expecting to find the Old Town so charming, after being a little underwhelmed earlier on, the winding streets punctuated with tower houses, charming little squares and two rather impressive churches. The crazy rococo decoration in the Alte Kapelle was rather impressive (once I fathomed how to get inside) however my particular favourite was the wonderful Romanesque Scottish Portal at St Jakob's church, this was also next another of the city's breweries where another plate of local sausages and delicious sweet mustard helped cement my new found admiration for the city. I visited Regensburg in June 2013, just after the terrible Danube floods in Passau. The water level was still high when I visited the river bank opposite the cathedral was completely flooded as were the nearby gardens. Some of the houses and restaurants still had sacks of silt in front of their doors! Luckily there were no major damages in Regensburg. I really enjoyed the view from the stone bridge and found a quiet spot in the shade just opposite the cathedral were I could enjoy the view. Most of the buildings are restored and are beautifully painted in different colours. It reminded me a bit of Prague or Budapest in a way but much smaller and quieter. 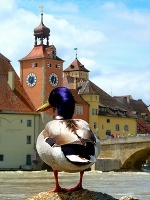 I went to Regensburg and nearby Nuremberg at the same day. I must confess my impression that the latter completely overshadowed the former. 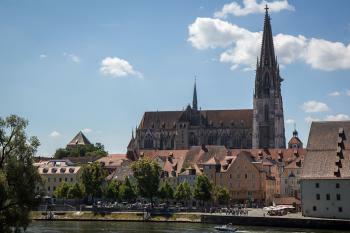 Both are mediaeval cities but while Nuremberg was erased during WWII and completely reconstructed afterwards Regensburg still preserves its original buildings. Is this a reason enough for its inscription? Dresden is a good counter-example. Well regardless of Nuremberg, I can say that Regensburg is a relatively dull town unlike many other colourful mediaeval towns in Germany (or even in Bavaria). The only thing that truly impressed me there was the stained glass at the local cathedral. 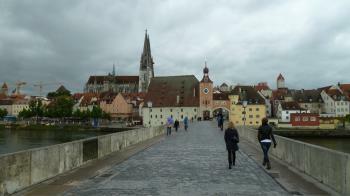 I agree with the other reviewers here - Regensburg is really a beautiful town with a fascinating history. The old town is very compact and wonderfully preserved, luckily having escaped any destruction during WW II. In the Middle Ages, many Imperial Diets (Reichstage) were held there, largely because of its strategic position on the Danube. From the end of the Thirty Years' War until the end of the Empire in 1806, the Permanent Imperial Diet had its seat in Regensburg's Town Hall. Now there is a really interesting museum there, with many original rooms. 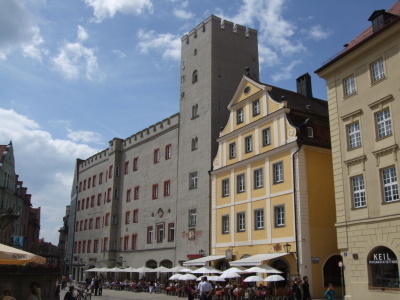 We lived in Regensburg, in Stadtamhof on the main street, for 4 years. It was an amazing town full of charm and character. Parts of the old Roman wall still exist and the Steinere Brucke is over 800 years old. You can take tours of the city...highly recommended. Christmas is a wonderful time to visit as there is a Christkindlmarkt in many of the squares. Damaged in World War II: Despite having the Messerschmidt factory nearby, which was heavily bombed, the old town escaped damage. Except for the historic "Steinerne Brücke" (Stone Bridge) of 1145, one pier of which was blown up by the Nazis in an attempt to stop the US armies!! Judensau: Mid 14C "weathered sculpture of a Judensau .. from the south façade of the Regensburg cathedral. It depicts three Jews, who were originally identified by pointed hats"
Breweries: Spitalbrauerei: 'The Spitalbrauerei (Hospital, Hospice or Almshouse Brewery) was founded in 1226, which makes it the City's oldest brewery, and the World's oldest Almshouse Brewery. Its address "At the Foot of the Bridge"
Twin Towns: Regensburg and Stadtamhof: the latter was a rival neighbouring city until its incorporation in the 20th century. 247 Community Members have visited.